With the countless paid options that offer file conversions out there, it’s always a huge relief to discover an excellent free service. Today that comes to us from Google, and if you’re looking to convert a PDF file to a DOC, while retaining it’s formatting and serving as a PDF editor too, you won’t find a better free choice than Google Docs, the web based office suite from Google. The other perk to this approach? It’s completely cross platform compatible, so you can convert and edit the document from any browser on any OS, be it Windows, Linux, or Mac OS X, and you’ll know the document will turn out the same every time. The converted PDF file will download as a new DOC file from the browser. Other than providing for extremely easy and accurate conversions, you’ll find a major plus is the PDF is now completely editable while retaining it’s original layout and appearance. You can switch text, graphics, rearrange the layout, change the files content, or do just about anything. 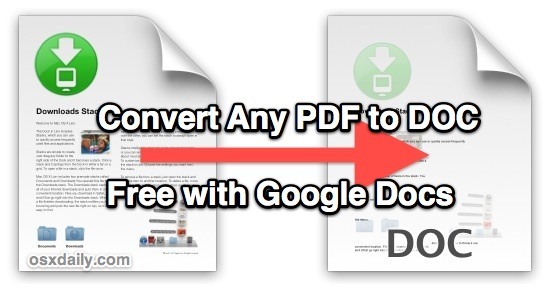 In other words, Google Docs functions as a completely reasonable and free PDF editor and conversion tool. This is a much better solution than the other free web based alternative we discussed recently, ZamZar, because it preserves just about every aspect of layout and allows editing for free as well, preventing the need for other editing tools. A big shout out to Chris for pointing out this feature. But are they really going to do that? Fair point for some personal use, but for a casual conversion it seems fine. The google converter can only convert file up to 2MB in size, which is not too useful as most PDF files would probably be larger than 2MB. People have become accustomed to using online converters, but remember, if the PDF contains anything that is at all sensitive, don’t use an online converter. Don’t give Google or any other person access to your private information or that of others. Notice that many of the non-Google converters are anonymously run. That should be a tip off that they may be run by scammers or mafia or even governments. u r right. It didn’t work. couldn’t edit the layout of text. Why are so many file converters, such as pdf-to-doc converters, “online” programs. I’m not even sure what that means. If I convert a file, I will want and expect it to be stored on my hard disc like every other file I need/use. If I had any sensitive files, I’d want them to be only accessible to me — again, on my hard disc. It seems as though other PC users would want these basic, simple requirements met as well. Document converters, even free ones should be downloadable stand-alone programs or programs incorporated in other free programs, like Acrobat for instance. Adobe gets us hooked on their “free” reader, nagging us continually to get various upgrades, then provides only paid subscriptions for our monthly ability to convert their proprietary files to usable ones. It really p****s me off. I won’t subsidize Adobe’s s***w-job as a matter of principle. They make enough money already from us by usurious prices of other products, e.g. Photoshop. I wouldn’t install a single Adobe product onto any of my computers. 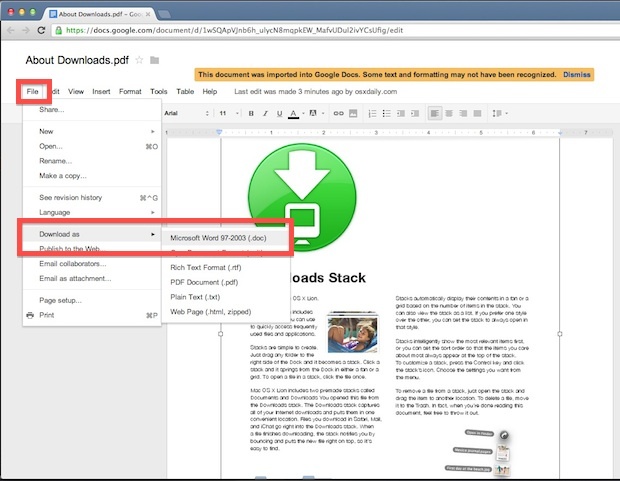 You can convert and edit PDF files with Google Docs, and Preview in OS X can edit and view PDFs. Good enough. Hi. There is no “create” button I can find. Has the drive format changed since 2012, and now, what is the protocol to get this feature to work? Also, the MB conversion limit is only 2 MB, someone said, which is *nothing* for most PDFs. Thanks. I await your reply about the protocol now, since I can’t find a “create” icon. Correct. The create button has been removed in the new version of Google Drive. There is no ” Create” button any more. Fully agree with the folks that are concerned by privacy concerns of Google Docs. On the other hand, I use many public domain Google books for research, but I find that some (or all?) are not always PDF-searchable, once downloaded. I have relied on ABBYY FineReader to convert these PDFs to ‘PDF-searchable’ files, but ABBYY have no plans to support the application under Mac OS Sierra, so I am in the market for good advice on this issue. Best regards. Paul.